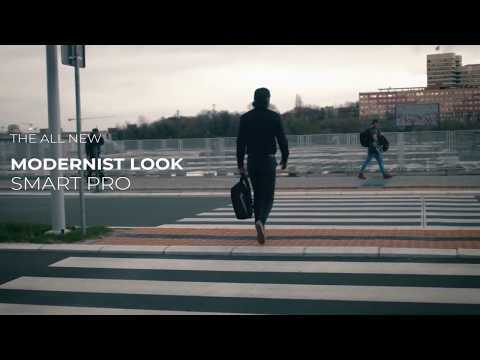 Whether you are commuting to work or going for travel, the Modernist Look Smart Pro is ideal for any situation. 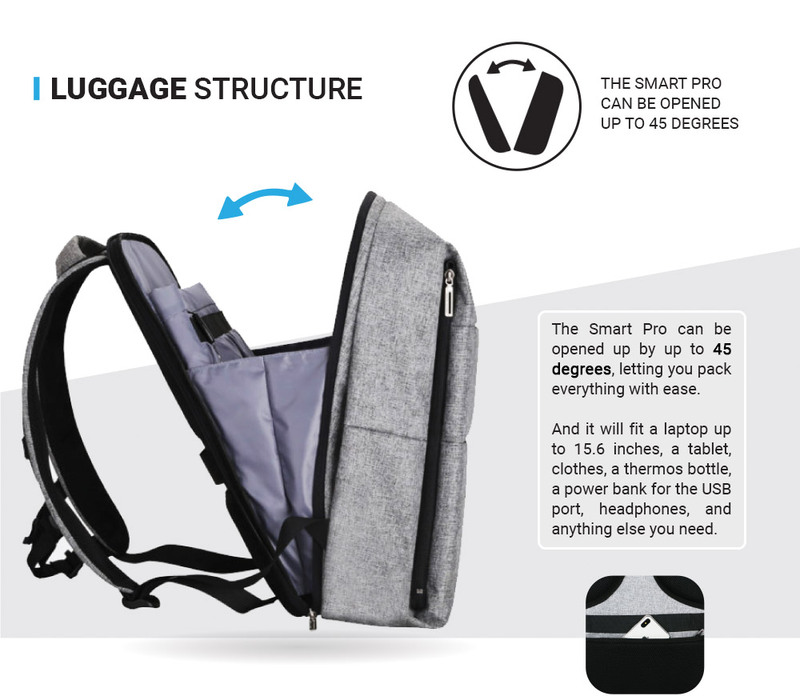 The Smart Pro features an S-Type strap, which reduces the stress the backpack has on your back and posture. This means that you’ll feel much more comfortable wearing it every day, and also it will have less strain on your back. We ship worldwide and some countries are faster than others. It depends on where you are located and how far you are from our logistic partners' warehouse. It takes around 1 to 2 days for us to process your order for shipping. ** These are estimated delivery time. Actual delivery time will vary depends on many situation. The backpack is water resistant but not waterproof. This means that your belongings will be safe during light rain condition, however will get wet if submerged in water or in a full rain pour. Is there a warranty period for the backpacks? The warranty period is 1 year. 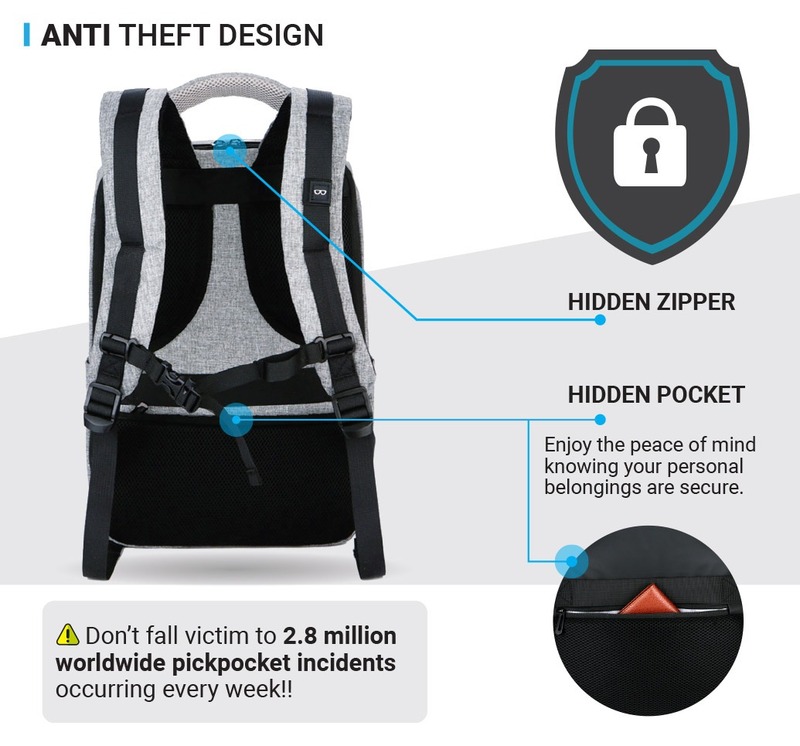 If you have a problem with the backpack within this period, please provide a photograph with the faulty part. We will then assess the problem and come up with a solution. 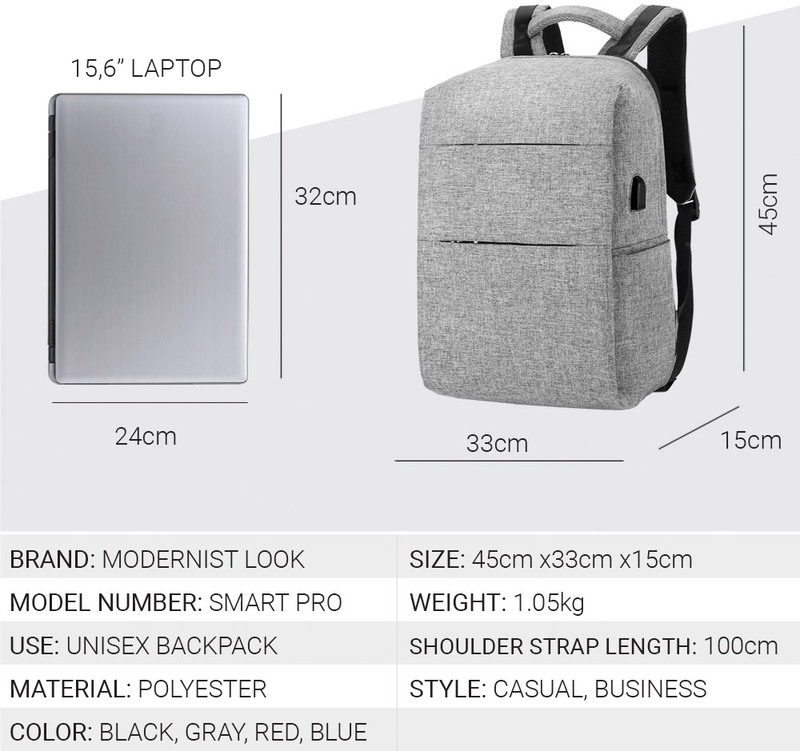 Is the power bank included in backpack? 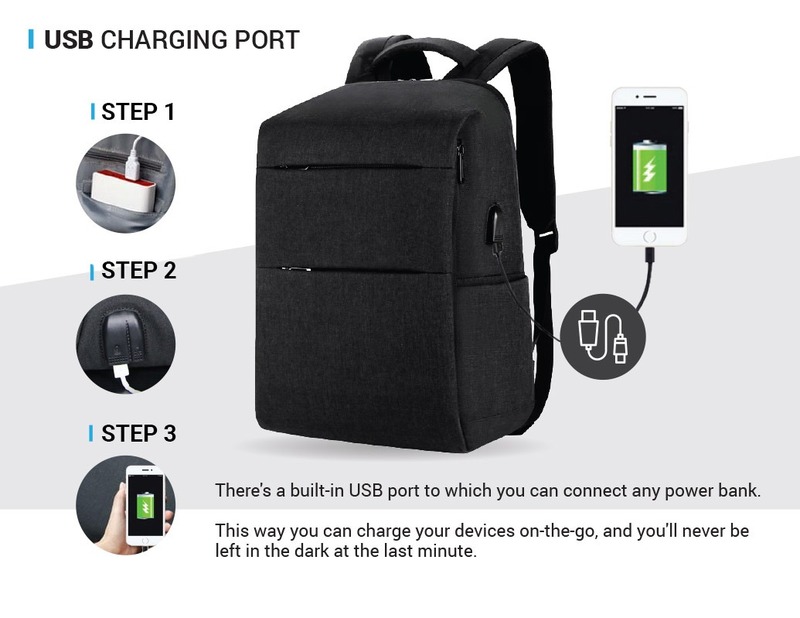 No, powerbank is not included in this backpack. 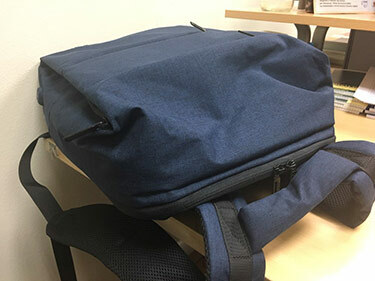 There is a simple connection inside the backpack that make sure that you can easily connect all power banks that are on the market (by USB plug). This way the power bank will never be outdated and you can keep using new models to charge your devices. Because this backpack will last for awhile! If you find yourself in the situation where you want to cancel the order, please let us know - contact our customer support (Select Order Cancellation & Input your order email & order number or it might fail to hold your order while our CS process your refund) - within 24 hours. Otherwise there is a possibility the order gets to be processed and shipped. Why is tracking link not working yet? Please allow up to 3 days for shipping information to show up as tracking information is only updated when the package gets through parcel point hubs. This also means that if the tracker does not update daily the package is still on its way to you. If the package is not received within the 30 business days, please contact us. I am a distributor, how can I get in touch if I want to sell your product? Used this for the first time to replace my little conference interpreter roll-on suitcase, and I absolutely love it! 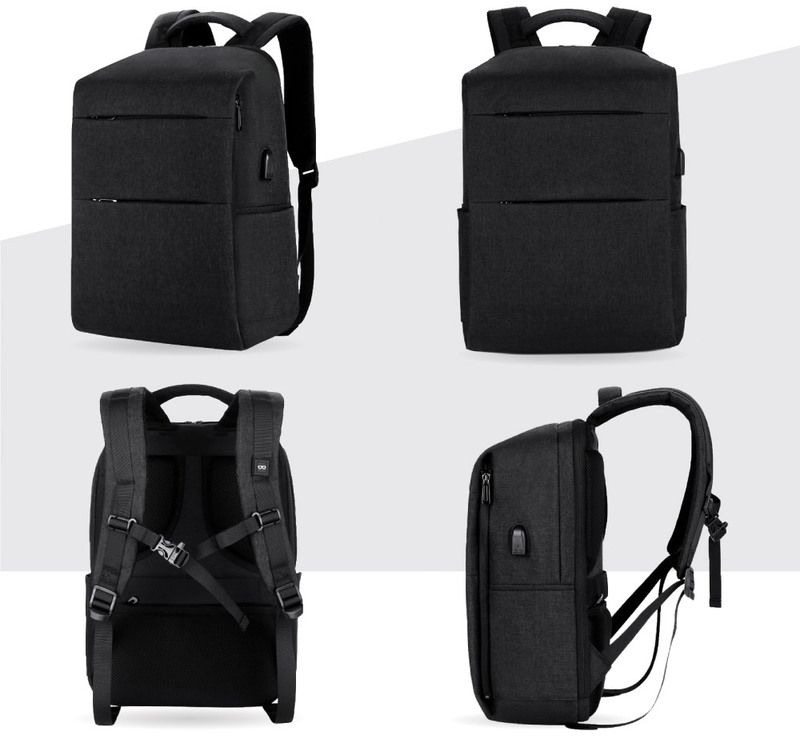 The weight is really well distributed and comfortable to carry, even with all the tech I need to carry with me. I have much more peace of mind, not having to worry about overhead locker space, or at least not to the same extent. If you fly on average 4 times a month, that can be a major stress factor, and it certainly was for me. I found that for a two-night work trip, I managed to get everything I needed into the backpack, and there was still room for a duty-free purchase. The pockets and pouches are also well thought-out. Everything I needed to have at hand during travel (including charging cables for phone at the airport) was easily accessible, basically because of the excellent way one can organise things. I am a convert, and for most of my short work trips, I won’t be using a suitcase anymore. Loved my backpack. It fits my laptop, books, cosmetics bag, everything. It feels confortable. 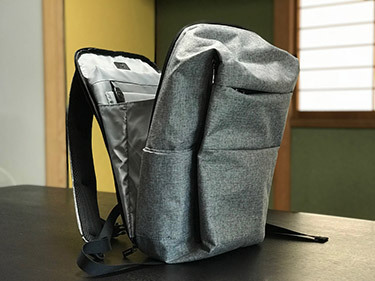 Nice good looking backpack, loved the design. 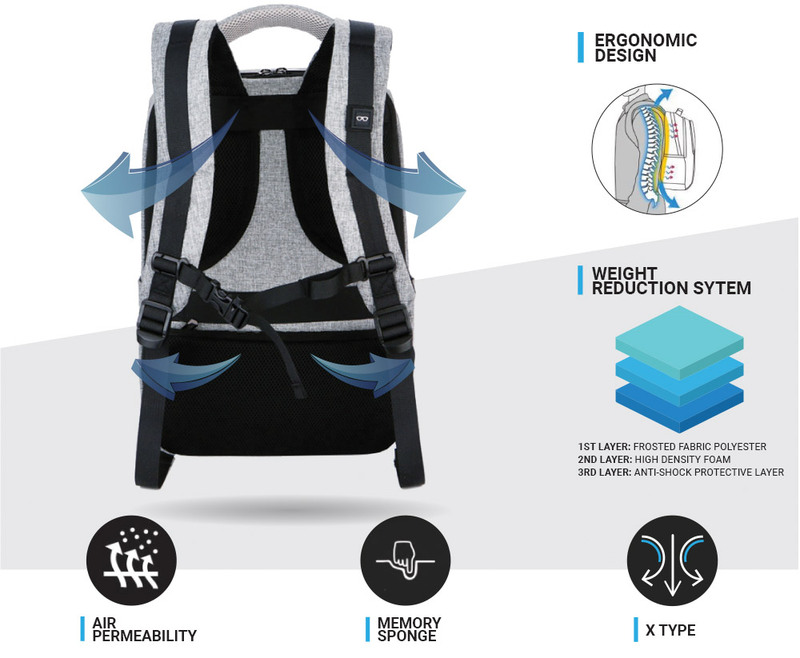 The video shows “the backpack reinvented”. 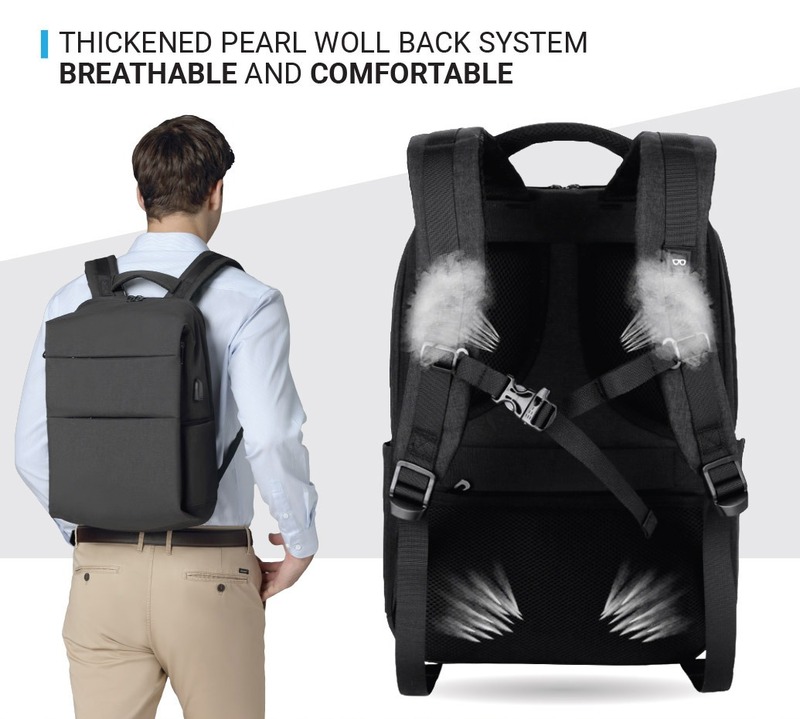 Yes, this backpack has a very different structure and logic compared with the traditional ones. I had to make a real effort and rething my way to pack. 2. Very ergonomic, I did not feel the weigh of the backpack during the long walks despite it was fully packed. Very very nice! 3. I like the possibility to load my mobile on the go. 4. 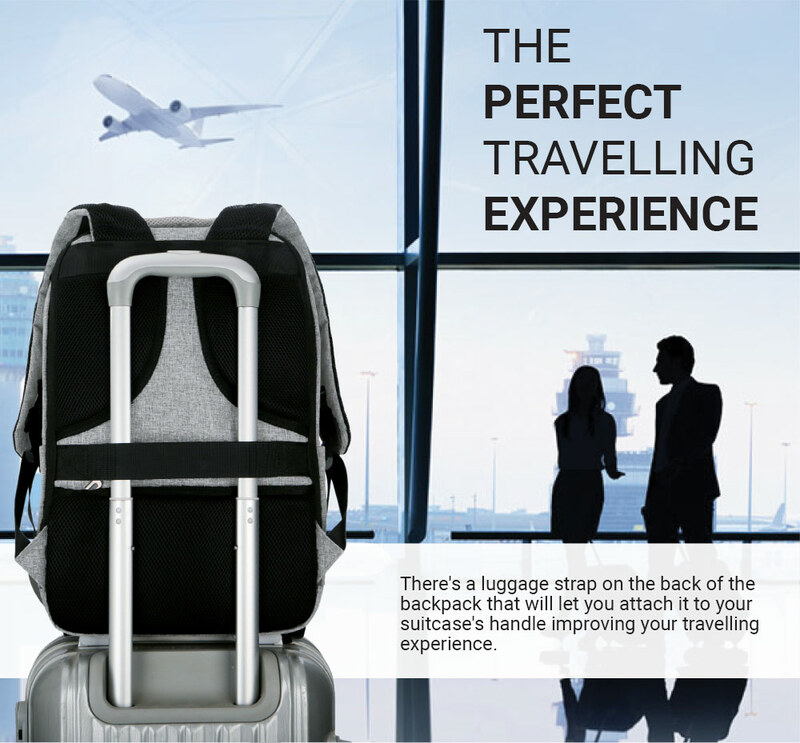 It is easy to put the bag under the seat on the airplane. 5. Roomy, basic stuff for a trip plus reserve clothes were in the bag. 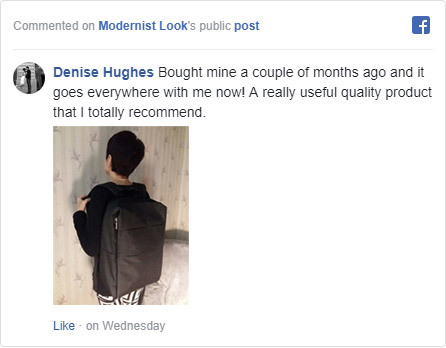 The material of the Modernist look is stiffer than the tradional backpacks so the bag is not too flexible. The rules of hand lugge are very strict on the European low-fare airlines. 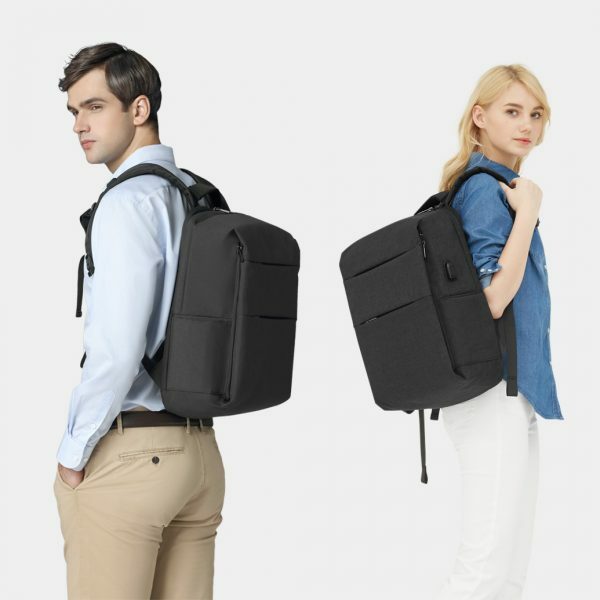 If one wants to achieve the best ratio of pressing the maximum amount of stuff into the limited size of hand luggage a more traditional backpack is better alternative. The bag is designed to be safe. Sometimes I, the owner had difficulties to unzip the compartments I am sure because it was first trip with Modernist look and not used to it) so the thieves have no chance! Organized compartment for pens, card, etc. Very nice bag, I will use it on my upcoming trips! This is my absolute favorite weekender and commuter bag. I have used this bag for weekend trips as well as day to day. I have been using the bag for 4 months and it still looks like new. I have nerve issues in my neck and shoulder, and my neurologist approves of this bag due to the excellent weight distribution when packed. The security pocket fits passports and travel documents well. Every aspect of this bag was thought out well. Buy this bag, you won’t regret it. It seems very suitable for traveling. I love the backpack. It’s very roomy and it’s money well spent. It is water repellent and I just love how comfortable it is to carry around. I bought this backpack to make a trip across the country. It is extremely roomy. It has one large compartment where (potentially) a laptop and document. A very stylish look and made very durable. Bought for everyday use and some light travel. Love the size, it’s super sturdy and looks chic! Plenty of room/pockets. 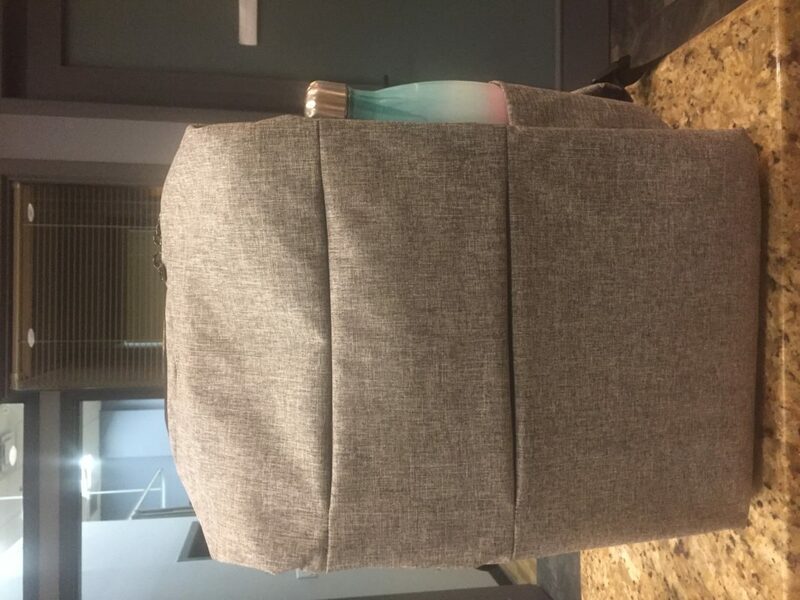 The backpack seems great but the color I received is not the one I ordered. I ordered a grey one, instead I received a blue one. 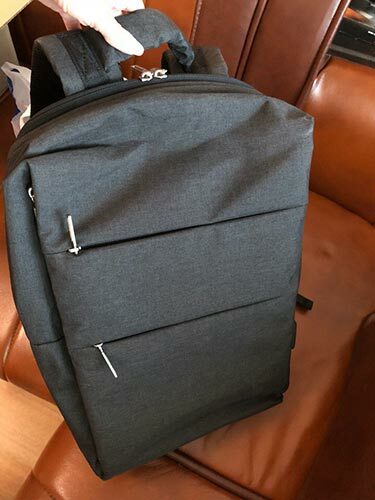 This backpack looks even more sleek in person, which i prefer over these bulky, baggy ones. However it fits more than it looks, while still hangs very comfortable on my shoulder with the padded back and straps. I love the inside pockets and padded pocket for ipad/laptop, which makes it easy to organize. 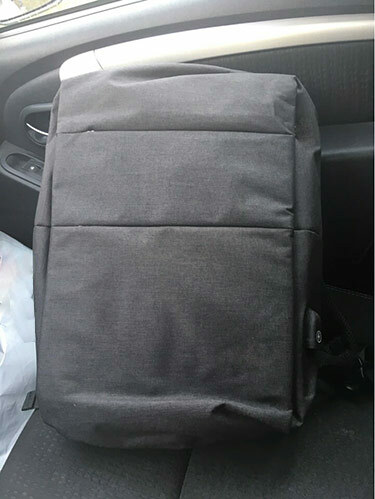 I ordered my backpack on the twelfth of jan, it wasn’t supposed to get here until early february due to lack of stock and shipment time to Australia. and it just got here , i am extremely happy with the purchase and it is exactly what its supposed to be. I highly recommend this backpack for school and everyday life. This is a great bag. Roomy, lots of pockets, comfortable. I had a small issue with the USB but customer service took care of it immediately. I bought this to replace my husbands very old and very used backpack from his college days. He lugs around a 17 inch laptop, and the old backpack did nothing to protect it. I worried that the compartments may be a little too small for everything he usually keeps, but he has no complaints. Would recommend. I really like all the organizational options and pockets. This bag holds a lot! I use it for work. 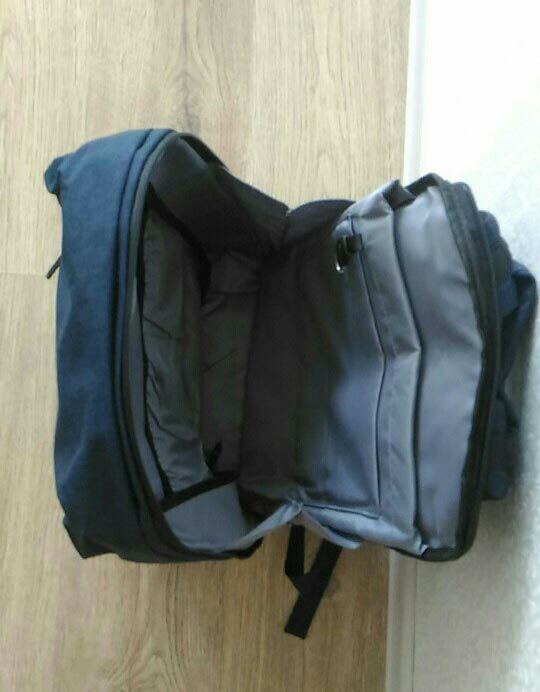 Excellent backpack, it has plenty of room and the zippers open easily. I do have one negative and that is when I connected my phone to the USB port, sometimes it is slow to charge. Just got this, perfect for going school with it! Fits all my school needs! Giving this 2 Star because the backpack was lost in shipping transit. So it was delayed for me to get the backpack. same as told. Very nice product good quality, waterproof. only misunderstanding was that the charger is not present in the bag. we have to place our own power bank. 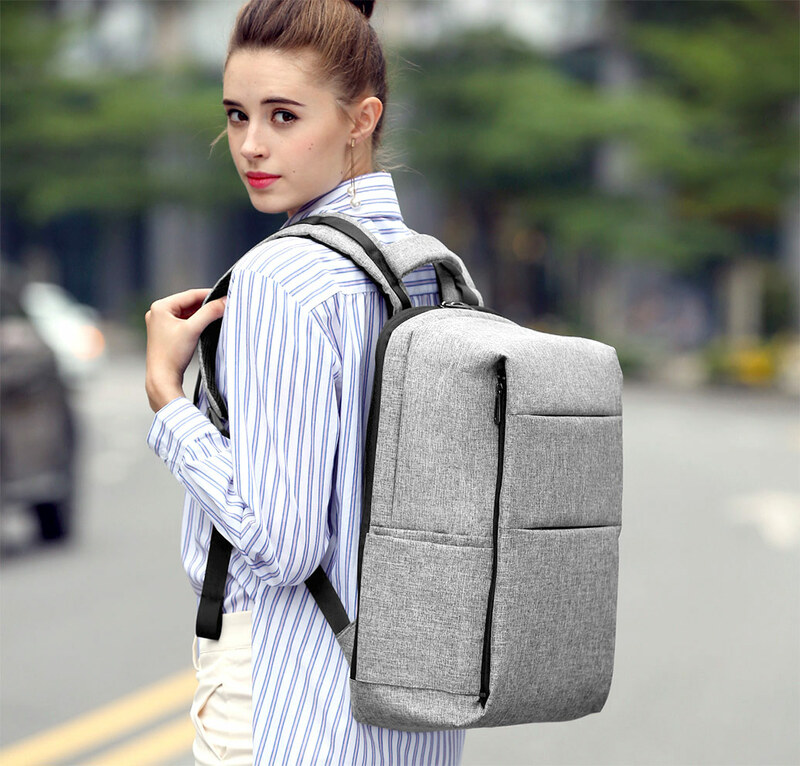 Very nice backpack. The quality will have to prove itself over time, but I hope it will last 2+ years. Thanks again! Amazing product with a stylish and cool design. Item arrived within 3 weeks! Ok with it. Cool bag, large and comfortable. I am 186cm was afraid it would be small! 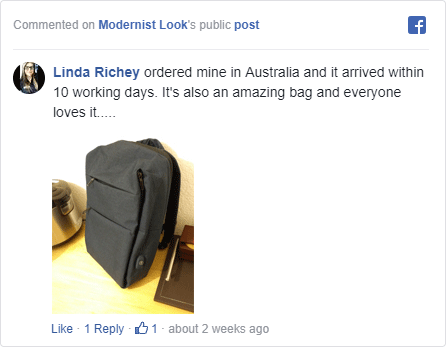 Comfortable bag, I tend to walk a mile or two each day and it is very easy to carry even when almost full. Too many useful pockets to mention, love the keyring attachment saves me carrying key in my pocket whilst walking. Nice bag just need to buy my own power bank. 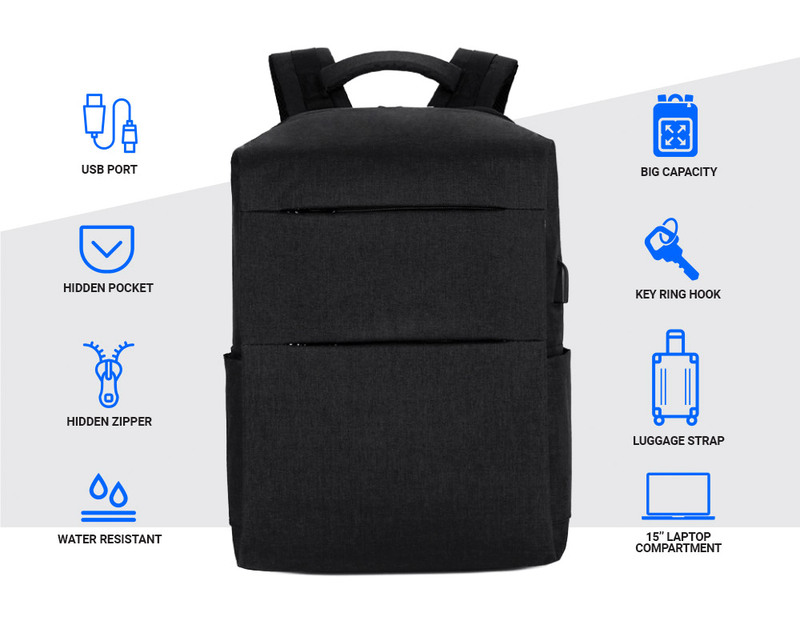 Great bag, might struggle to get some of the larger laptops in though, 17″ screens would be a challenge. Love the external USB port, already ordered a better power bank as the one I had was never used this much before. Nice colour, I went for the light grey one. Does not fit a 17″ laptop! 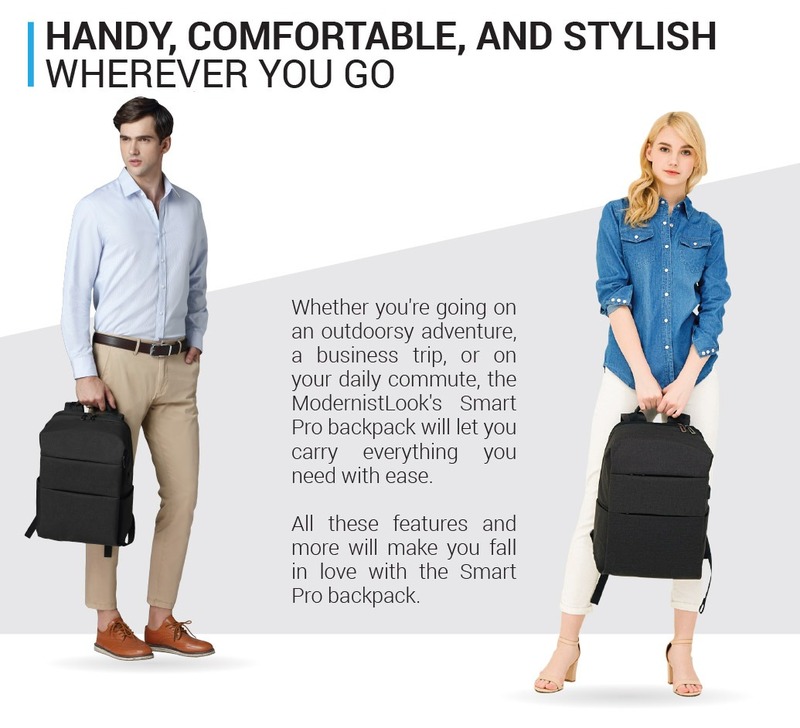 I should have read the specifications better but great backpack. Commutes are a breeze, charged my phone on the journey and it is now 100% for the busy day ahead. The backpack is bigger than you think. Also if your powerbank has an on/off button, you will have to open the backpack to access it, vs they should have put a small zippered pouch on the outside to access the charger. 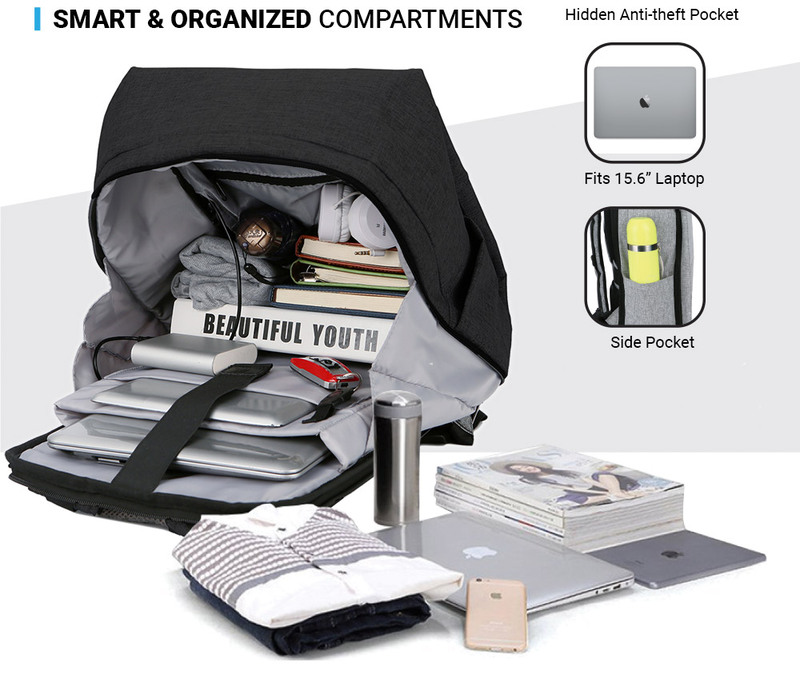 You could fit two large binder inside the compartment and maybe three-four college size text books. It took sometime to receive my backpack but it is exactly what I wanted. 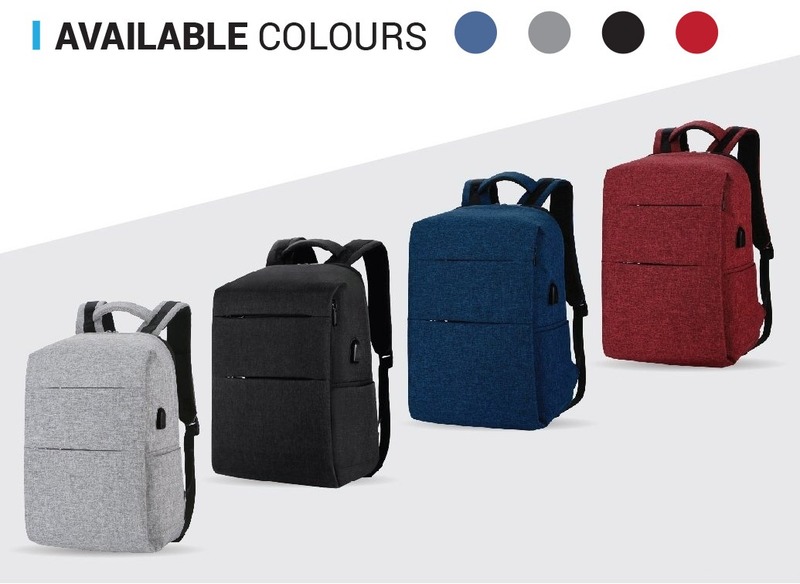 A bag that would securely carry any financial and personal items and not give easy access to the back of the pack for “pick pockets”. The charging port is a bonus making it easy to carry a portable charger and charge my phone. The inside has many compartments which is handy for the purpose I wanted it for.